“Food insecurity is prevalent on college campuses in the United States and abroad. The Washington Post states that 36 percent of students don’t have enough to eat. 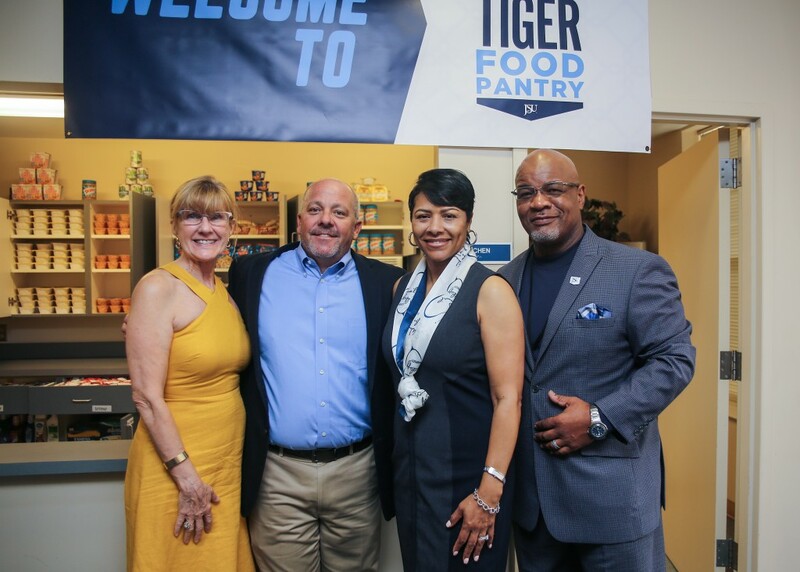 36 percent,” first lady Deborah Bynum emphasized to the audience at the ribbon-cutting ceremony for her Tiger Food Pantry initiative on Wednesday. 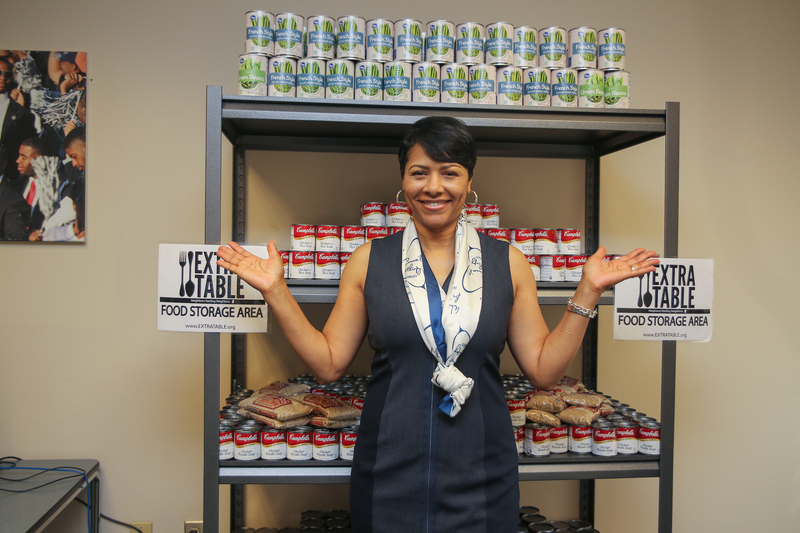 Housed inside the university’s Campbell Suites North, the food pantry is the last of four initiatives – Tiger Career Closet, Tiger Recycling Program and a scholarship luncheon – that Deborah Bynum has implemented or expanded. Through a series of university and community partnerships, she was finally able to bring her idea to maturation. In the past, Deborah Bynum has shared her thoughts on starting a food pantry. However, the idea was further nurtured due to her being awakened at night by the sounds of the school’s marching band the Sonic Boom of the South. The first lady explained that she realized the cafeteria was closed and some students more than likely had no funds for meals outside their meal plans once their extra-curricular activities had ended. She also said that, in addition to alleviating hunger within the university’s student community, the pantry also aims to decrease the impact that food insecurity has on students’ academic prosperity. “We have labored hard to ensure that our students have the tools they need to be successful while they matriculate here at Jackson State University,” she said, as a visible elation washed over her face. 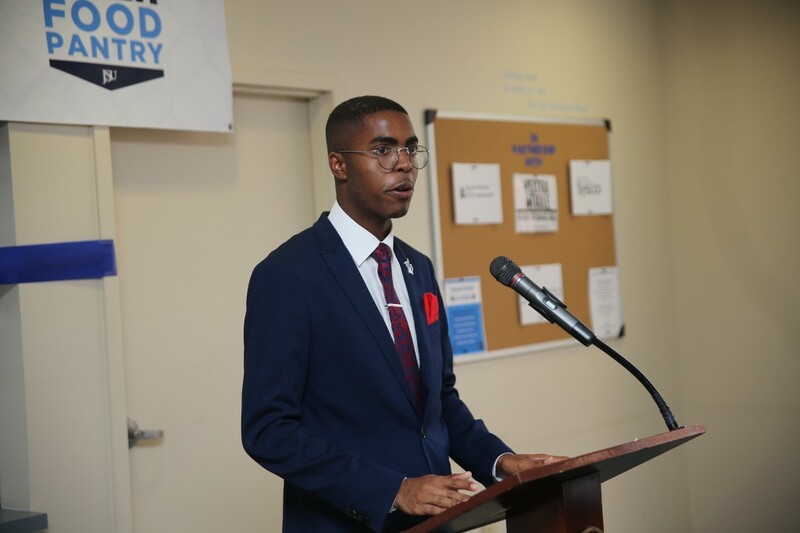 Senior biology major Khaylan Foy said giving students access to toiletries and food at no cost is a great idea, and he was glad to be a part of the opening ceremony for a worthy cause. “Anytime we can invest in the holistic success of our students it is a joyful day,” said Dr. Kimberly Hillard, executive director of JSU’s Office of Community Engagement. She explained that more non-traditional students are returning to school and are working two or more jobs to meet their living expenses. “So if we can provide them a healthy alternative to alleviate some challenges then we are here to assist them with that,” she added. 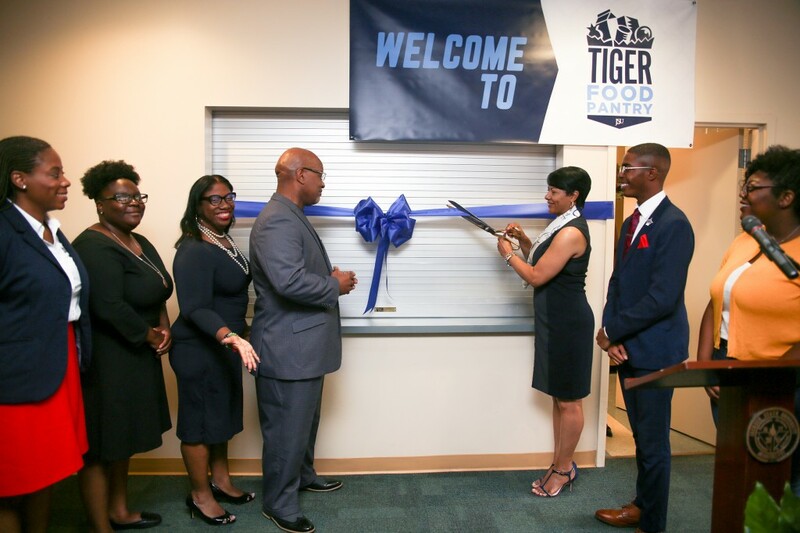 Before Deborah Bynum cut the enormous blue ribbon fastened across the pantry’s service window, her husband and JSU President Dr. William B. Bynum Jr., shared his joy and excitement at what his wife had accomplished. “I am so thankful for the first lady’s vision and her ability to determine the needs of some of our students,” he said. Aside from the couple’s years in higher education, the president said having six children has given him and his wife an in-depth look into the fundamentals that college kids require. After reiterating the importance of the pantry and his wife’s other initiatives, the president’s remarks grew more sentimental. He revealed his gratitude for having an “awesome helpmate” in Deborah Bynum. 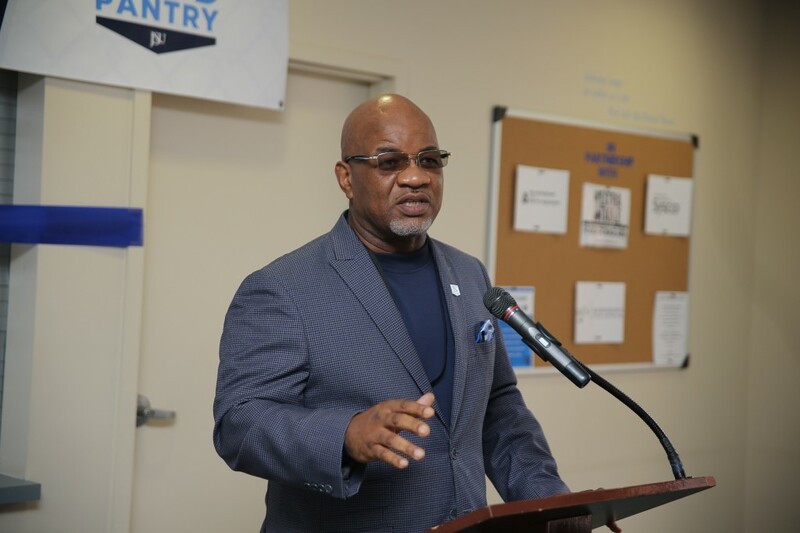 He further expressed that it is significant for students to witness a husband and wife team leading and working together not only for the betterment of Jackson State but also on behalf of the student body. “Now we just need to make sure people fill up this food pantry,” he charged. 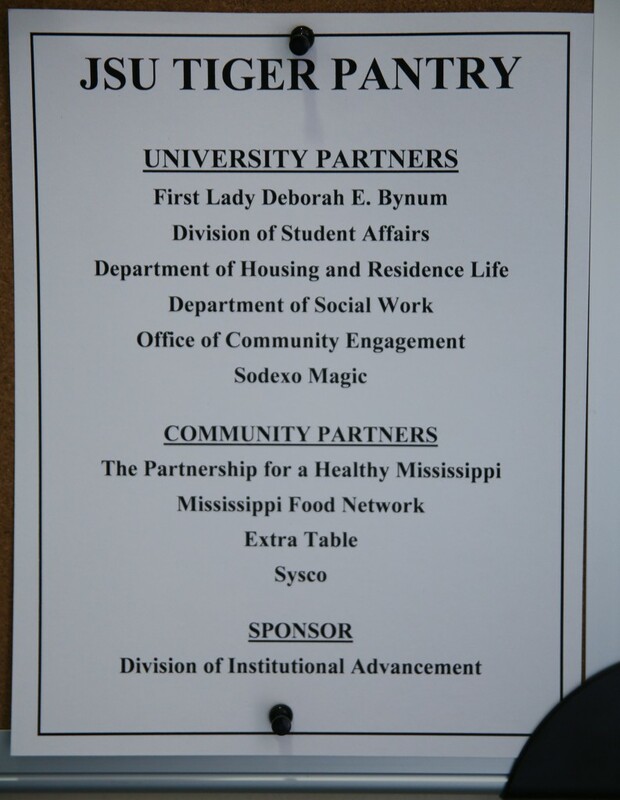 With a mission to change the culture of health in the state, The Partnership for a Healthy Mississippi, a 20-year nonprofit organization, was one of several collaborators at the event. Shelson further explained that Mississippi has a large population of children on free and reduced lunch in the public school system. “That doesn’t go away just because they graduate from high school… A lot of these kids may still live at home. Again, there is no free or reduced lunch when you’re in college,” she said, then pointed out that hunger impedes kids trying to better themselves and get an education. Communications and community engagement director for the nonprofit, Langston Moore said he recently read that “hunger happens between a bag of chips” and the words resonated with him. Shelson and Moore are working to debunk the myth that because a person is in college that naturally means they have economic stability or access to means. Deborah Bynum took a pair of gigantic scissors and sliced through the blue ribbon, signaling the pantry is open for business. Attendees lined up to view the quaint kitchenette complete with a stove, microwave, and a refrigerator. Cabinets are already stocked with items like peanut butter, microwavable macaroni and cheese, pop tarts and cereal. There is also a storage area that houses shelves of food and hygiene products. 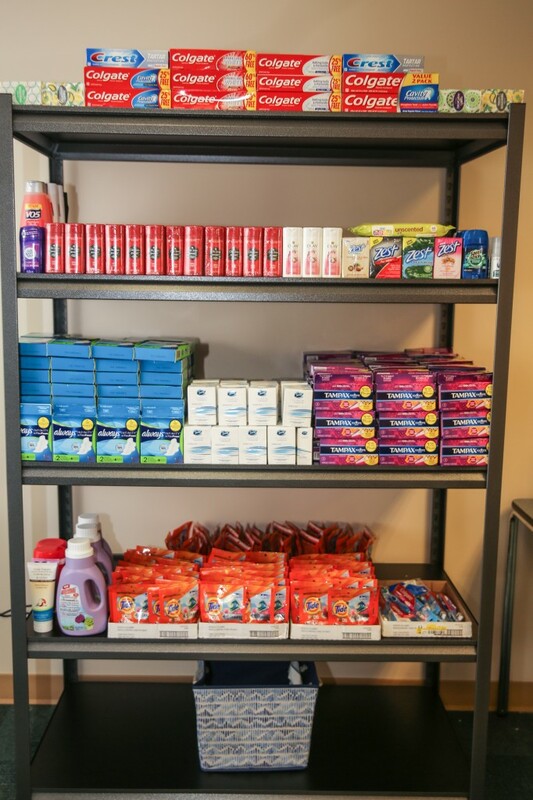 “We have to go where the students are,” said Tammy Timbers, executive director of JSU housing, when asked how the food pantry came to be located in the lobby of the Campbell College North residence suites. She shared that campus residents may be ashamed to ask for extra supplements, but having the pantry in a familiar environment with resident directors students engage with on a daily basis makes the process more comfortable. Requestors will also only be required to provide their J-number for anonymity. For those looking to donate, Timbers suggests that people contribute healthy, microwaveable and non-perishable options. “This is an awesome initiative, and it falls in line with the president’s pillar – student centeredness,” said Timbers. The food pantry website will go live next week. In the duration, to make donations or requests for food assistance people can email Timbers directly at tammy.m.timbers@jsums.edu. or Campbell North Hall Director Sean Wallace at sean.a.wallace@jsums.edu.